Is it love? Is it weakness? Hope or desperation? Why do we do it? Again and again. 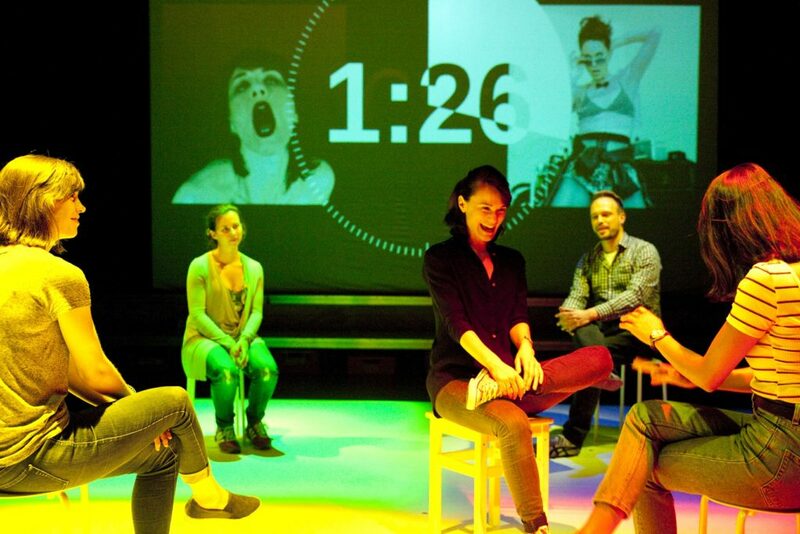 In this interactive show, one woman finds herself on the brink of love, lust, fear and hope. YOU, the audience, are her dates. YOU decide how her story unfolds. #Instalove is a joyful, electrifying, and at times stormy celebration of all the reasons we seek love – from the playful to the pathetic, the pragmatic to the passionate. It transposes the quest for love into a live competitive game, in which Catherine competes with herself – her many selves – for the audience’s affections. The audience are her co-players and vote for a winner, so every night is different. Laugh, sigh, dance, and cry. Expect to make one hot mess. Together, you and Catherine will explore the modern search for timeless romance. After presenting Catherine’s performance Celebrity Bound first as part of the 2014 Expat Expo | Immigrant Invasion Festival and then in two separate additional runs, we are thrilled to bring back our production of the world premiere of #Instalove freshly from a 20-performances run at the Edinburgh Festival Fringe!! Special thanks to Lovoo for their support! There will be a post-performance event in conjunction with Lovoo on October 26 exploring the topics of “Love in the Digital Age – Insights by LOVOO and an External Research Project” and Love is Risky vs. Love is Predictable in the Era of Dating Apps”. There will also be a post-performance discussion in conjunction with Theater Scoutings Berlin on October 27! Berlin-based US-American performer, writer, director Catherine Duquette specializes in audience-performer relations and improvisation within scripted drama. She creates intimate participatory works that draw on autobiographical materials to share contemporary experiences with active audiences. Curious about expanding notions of performance, Catherine fuses theater, interactive poetry, scripts, and choice-based narrative for video games. She is currently exploring game design as a dramaturgical approach to theater in order to allow audiences more emotional and personal investment in what happens on stage. Based in Berlin, her work has been supported by MOMENTUM Gallery, Camden People’s Theatre, Battersea Arts Centre, theSpaceUK, TRAFO Center for Contemporary Art in Poland, a Fulbright Fellowship in Spain, the International Festival of the Delphic Games in Greece, the Boulder Museum of Contemporary Art in Denver, Colorado, and the Subterranean Art House in Berkeley, California. Artist and agitator Ruth Sergel creates compassionate works that explode out the boundaries of traditional mediums. Inspired by rebels, visionary pedagogues and magicians, Ruth’s work bridges art and technology, memory and wonder to incite individual and social transformation. Ruth’s films, public interventions and interactive installations have been exhibited at the Museum of Modern Art, Boston Museum of Fine Art, Corcoran Gallery of Art, National Museum of Women in the Arts, New-York Historical Society, Gray Art Gallery, Anthology Film Archives and 3LD Art + Technology Center. Her work has been shown internationally including Clermont-Ferrand (France), Shift Festival (Basel) and Théâtre de la Ville, (Paris) as well as broadcast on the Independent Film Channel (IFC) and PBS. Ruth’s projects have been supported by the Jerome Foundation, New York State Council on the Arts, Experimental Television Center, Lower Manhattan Cultural Council and the 21st Century ILGWU Heritage Fund. Ruth was the Resident Researcher in Video at New York University’s Interactive Telecommunications Program (ITP) where she received her Master’s degree and a fellow in Public Humanities at Brown University. Additional residencies include Yaddo, Squeaky Wheel, CESTA (Czech Republic), Digital Performance Institute, and Here Arts Center. Her work has been widely covered in the press including the New York Times, NY Daily News, NPR, CNN, and the Huffington Post.